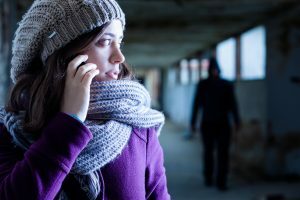 If you live in Southern Nevada—Las Vegas, Henderson, Boulder City, or Mesquite—and are a victim of stalking or have been accused of stalking, you need to reach out for the best legal assistance you can get as soon as possible. Stalking is often confused with harassment. Though similar, they are distinctly different. The Nevada Revised Statutes (NRS) 200 covers this crime in detail. Stalking crimes are generally straightforward: anyone without legal authority who makes an individual feel frightened, harassed, or fearful for his or her general safety or the safety of a family member may be guilty of stalking. If convicted, the first offense will be treated as a misdemeanor. A second offense leads to gross misdemeanor charges. Aggravated stalking is a more serious charge. Stepping up to this level means someone was fearful for his or her life. This is an extremely serious charge and could lead to prison time. If a firearm is involved, or threatened, the state may move to take the gun or guns away from the threatening individual and could lead to category B felony charges, which comes with minimum prison time. Obviously charges like this are extremely serious and may well follow an individual through life, so getting a defense prepared as quickly as possible is essential. Your life and freedom and future are on the line. In the digital age, cyber-stalking is a real problem. Using email, any Internet site, text messages, or social media to make someone feel unsafe is a category C felony. I have experience in this type of situation and my help to you can be very valuable. You don’t have to be physically confronted by someone to make you unsafe. People can hide behind digital profiles and still stalk you. Luckily the NRS keep up with changes in technology and has appropriate punishments. Whether we are protecting you from a stalker or defending you from false charges, we will base our case on what’s known as course of conduct. Whether in the real world or the digital one, everyone leaves traces of their behavior. Obviously we should all be careful with our conduct around one another, acting as civilly as possible, even with people we don’t get along with. Anything caught on video, in text messages, via social media posts, or witnessed can be used as offense or defense to strengthen or weaken our stalking case. Always bear that in mind. Constitutional rights are generally protected, such as freedom of the press and union picketing activity, so long as it is not directed specifically at individuals. Whatever your situation in stalking charges, the NRS most likely has a provision that will help me help you. We can also petition the court for a restraining order depending upon the nature of your situation. I can help make sure you and your family are as safe as possible as we move through the legal process. I have 30 years of experience in this type of law. I have seen most everything. To schedule an appointment with Douglas Crawford Law click here. To learn more about Douglas Crawford check out his bio here. To learn more about the types of cases Douglas Crawford Law handles check us out here.